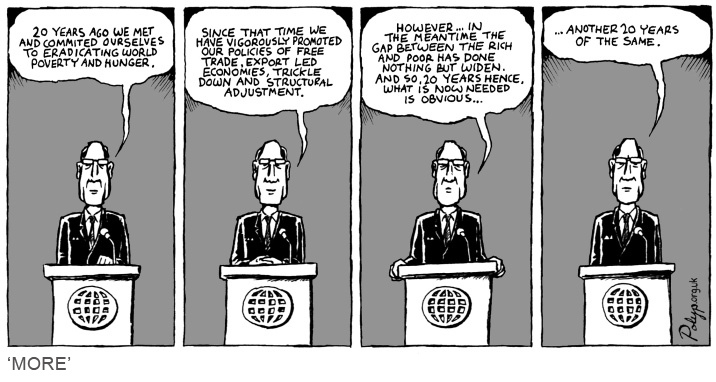 What was the Washington Consensus? How did it affect developing countries? The Washington Consensus is a set of ten points outlined by John Williamson summarising policy advice from Washington-based institutions to Latin America after the 1980’s debt crisis. It was right wing policy advice to correct failures of prior approaches to development. Although the policy advice initiated some growth in Latin American countries, the structural adjustments imposed by Washington based institutions also had severe negative implications. The policy advice had major consequences on various spheres of third world countries; rising debt, international trade, migration and the domestic social sphere. The excessive privatisation, liberalisation and market dominance that the consensus promoted had some positive implications on third world countries; achieving economic growth results. This was important as a main target was to improve their capacity to repay debt of loans borrowed prior to the crisis (1982). The consensus’s policy advice resulted in a sudden economic boom in many Latin American countries. Yet the boom did not result in substantial changes; for instance, GDP growth only rose to 3% compared to a poor 2% during the crisis. Although there is evident growth, it can only be considered substantial if one had low expectations in the first place. Even though the policy aimed to generate a fiscal surplus and reduce inflation that resulted from the government’s monetary financing there is evidence that even after structural adjustment debt figures were still high. The reforms were not beneficial on the long run; maintaining that Argentinian growth results were short-lived ending in a currency board collapse in 2002 as a consequence of the events of 1990. Hence, Argentina followed a highly unsustainable development path. In advocating a laissez faire doctrine and limited state intervention the consensus neglects the experience of the East Asian developmental states during the East Asian miracle. The East Asian miracle is proof that heavy state intervention and import substitution activities can improve economic conditions in third world poverty stricken countries as well as improve social conditions. The East Asian miracle in itself is a strong counter argument to the consensus’s policy advice. Statistics prove that many more countries in East Asia sustained high growth rates than in Latin America. Although the implementation of consensus’s policy advice delivered improved growth rates in Latin America and Africa (1990-2001), results of 1.5% for the former and -0.1% for the latter appear extremely poor when compared to East Asia’s incredible rise to 5.5 %. The consensus had significant consequences on international trade and migration. Although the policy advice should have provided new job opportunities, liberalisation and labor market flexibility stimulated FDI and trade competitiveness, but also fostered increased emigration from Latin America to industrialised countries. The liberalisation of trade should have allowed third world countries to embrace their comparative advantage in sectors of textiles, agriculture and other primary commodities, however developed countries were intensifying protectionist measures in these sectors. As a result third world countries could not compete and their efficient sectors were hampered. The widened wage gap between first world and third world countries which along with decreased trade barriers and increased mobility incentivised emigration. As well as a wider gap, this led to brain drain of skilled, efficient and effective labor from third world countries, where they were most needed to developed countries. Widespread critique of the consensus is that it focuses on economic aspects and neglects social aspects; scholars critiquing the consensus argue that the policy advice was only committed to growth which does not ensure poverty reduction. Conditionalities imposed by Washington-based institutions implementing neoliberal structural reforms affected the domestic social spheres of third world countries. While structural adjustments in Latin America and other third world countries achieved some growth, the social implications they had outweigh the benefits. Poverty levels, unemployment and injustice remain widespread in most third world countries. In general the measures demanded a fiscal surplus and open capital accounts, which both strongly hindered public spending. The Washington-based institutions demanded strict austerity measures and a reduction in government spending to increase public savings; education, health and infrastructure. They also demanded privatisation as a means for increased efficiency. Inevitably privatisation and austerity measures meant that merit goods and services were no longer accessible, which worsened living standards and equality drastically. As a result a widespread critique of the consensus is that it focuses on economic aspects and neglects social aspects; scholars critiquing the consensus argue that the policy advice was only committed to growth which does not ensure poverty reduction. As a result a widespread critique of the consensus is that it focuses on economic aspects and neglects social aspects; scholars critiquing the consensus argue that the policy advice was only committed to growth which does not ensure poverty reduction. Williamson, however, in defending the consensus, argues that the initial idea was to promote pro-poor policies yet misinterpretation and misuse in countries other than Latin America destroyed the impact they could have had on the poor. He argues that the biggest mistake was dealing with it as a one-size fits all policy. Williamson argues that taking the policies out of their context disrupts the potential of their effects. According to a DESA working paper from the UN, the rejection of Washington Consensus policy advice arose when people began to realise that poverty reduction is not a direct “by-product of growth”. Instead active social policies are required to address issues of inequality, redistribution and poverty. A common critique of the consensus is that its policies were not tailored to the poor, however they were transplanted from first world countries with high levels of growth stability and living standards onto third world countries with very different conditions – read more about imposing a Western discourse where it cannot be replicated here. The Washington Consensus’s liberal stance is is a highly contentious topic because it has major implications on the approach of the West towards the development trajectory of third world countries. Recently the consensus has received heavy criticism for one, failing to achieve desirable results in third world countries and two, diminishing the government’s role in providing public goods and services for its people. The growth boom experienced by certain third world countries like Brazil and Argentina after the implementation of the consensus’ policy advice reveal some degree of success. Nevertheless the social costs of the structural adjustment process highlight the insufficiency and inappropriateness of such policies for countries that are far behind developed countries. Furthermore the wide gap between the global North and global South and the lack of convergence is evidence that the structural adjustment programs were a hindrance to the development of third world countries. ‹ Why do we think West is best? › ‘Period Leave’: a privilege or a necessity?